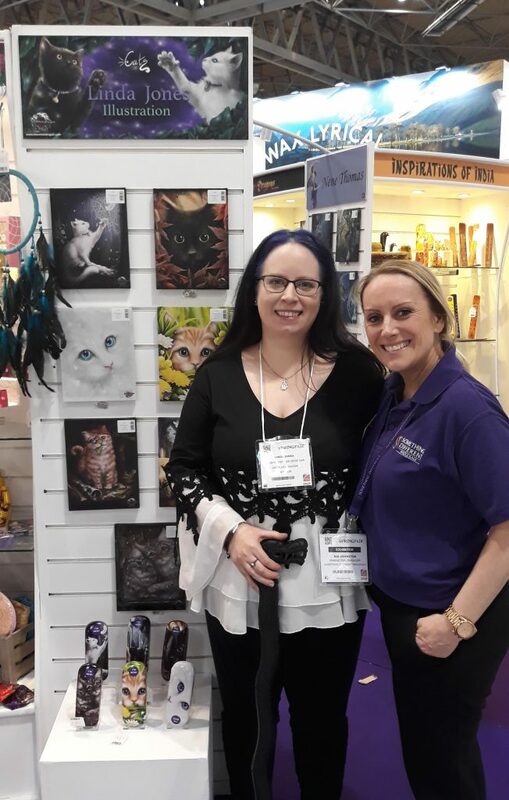 The massive Spring Fair is running at time of writing and I was honoured to be invited by theworldof3D to attend their stand, sign products and meet their customers (traders). 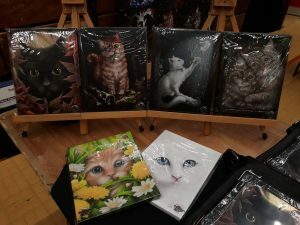 Theworldof3D produce wonderful 3D lenticular products, such as bags, purses, wallets, etc., and aside from the products they already had with my art were launching several new ones at the Fair. 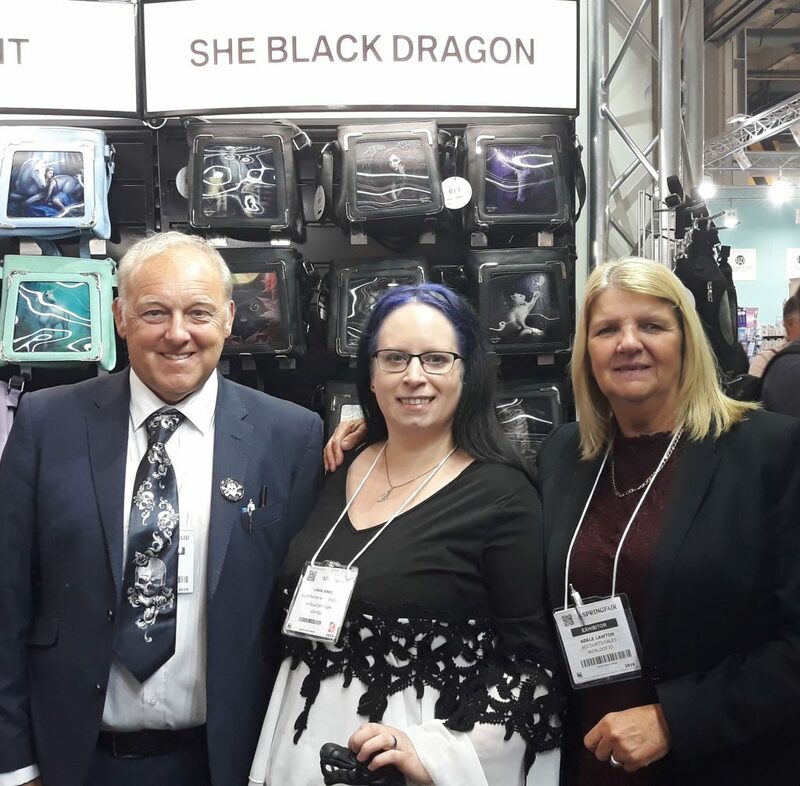 This was a great chance for me to meet up with the lovely business owners, Carl and Adele, as well as the traders who buy in my products from across the UK and one couple from Spain. Carl & Adele with me in the middle in front of my products. I spent a lot of time chatting with the lovely Nia, their marketing manager, about their other lovely products. So watch this space! Afterwards, I had a wander around some other wonderful company stands feeling inspired by the products out there and a few conversations. Watch this space for any future developments from them. 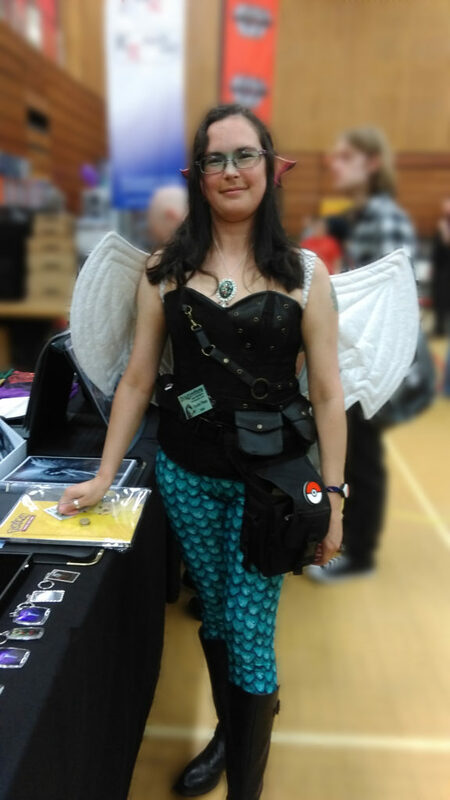 My local gaming convention has been going for a few years now and is steadily growing, this year with 1,200 people attending. 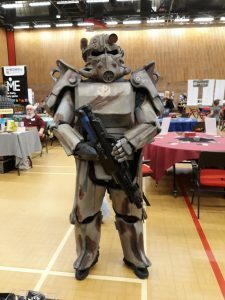 It has a healthy mix of games, guests, traders and cosplay as part of a family-friendly games convention and mini comic con in Newport (Wales). 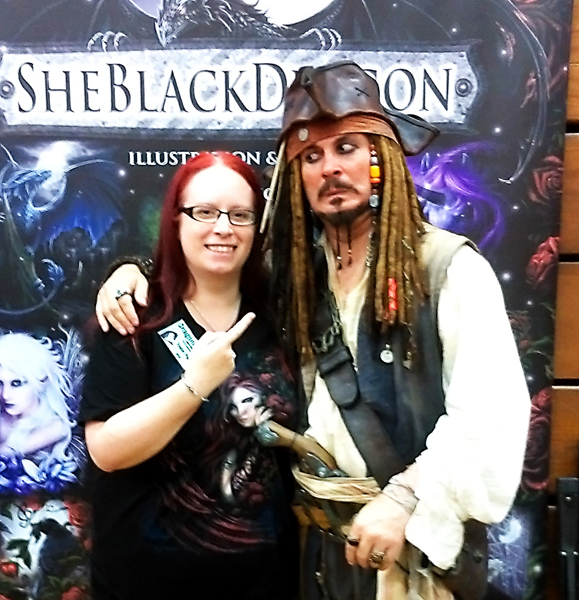 I was there again with my trade stand and my array of products, both licensed and self-produced. 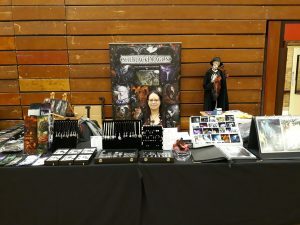 I have been trading since the very first Dragondaze (not including it’s earlier incarnation about 30 years ago – I’m not that old!). It’s a quieter convention than some, but I enjoy it immensely, and the flow of interest at my stand remains fairly steady. 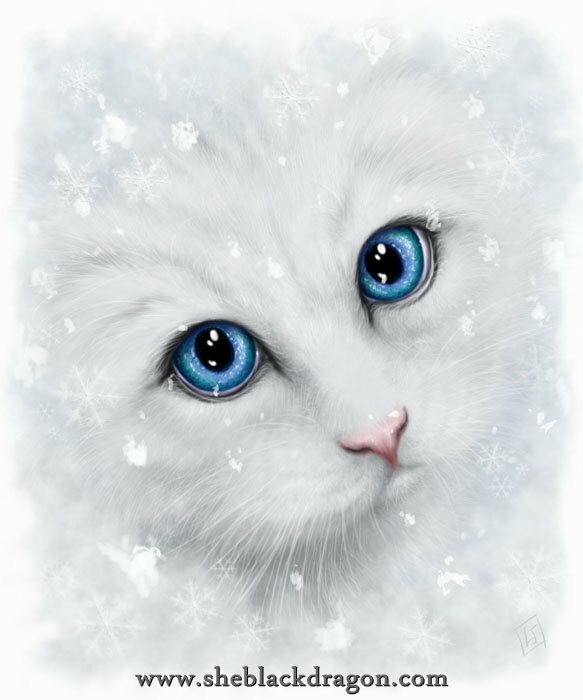 This year featured the debut of two new licensed products with my art on. Bags, purses and wallets by The World of 3D and small canvases by Something Different. I enjoyed the passing gallery of various cosplayers. Not sure who this is meant to be, but is little girl was Captain America and very proud of her daddy. This is Iron Warrior (who you can find on Facebook as Iron Warrior Cosplay). 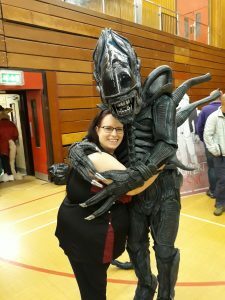 I founded “Hug An Alien” day, it would seem for the number of hugs this xenomorph received after. 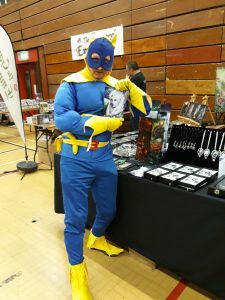 A little far from 29 Acacia Road – Bananaman found time to admire my wares while not saving the day. 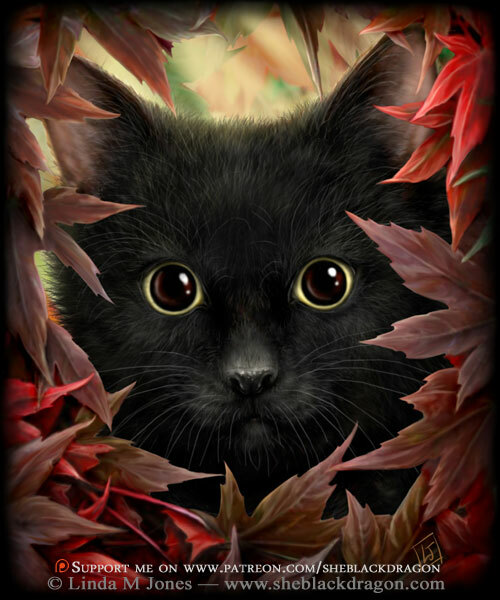 Vader thought he could sense much fear in me – but as I told him, to his fear, I trembled not with fear but with love. This year I did not have red hair. 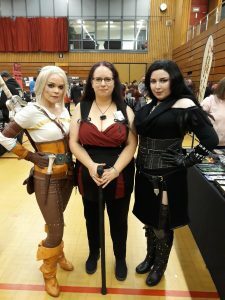 Had I known I would meet Ciri and Yennefer from Witcher 3, I would have dyed it red again so I could be Triss. 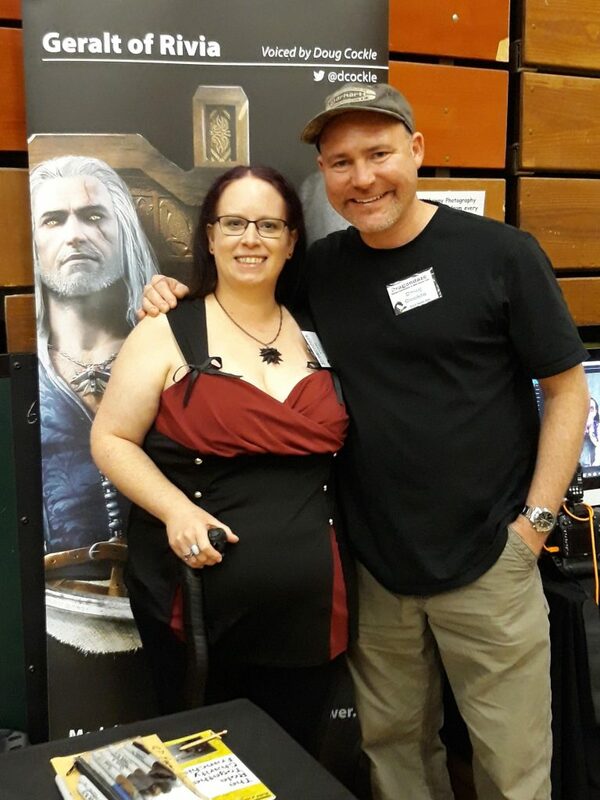 The man behind the voice of Geralt! In total, Dragondaze raised £2,555 split between Sparkle, Barnardos and the Lions Charity Fund. 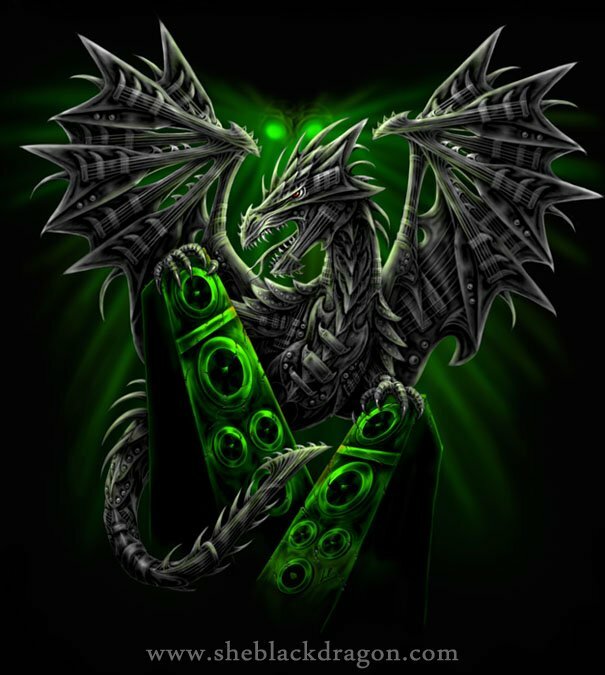 My dragon art, of course, shall continue as it is a subject I am passionate about, and I still ultimately want to work towards my flower dragons collection with the hopes of compiling them into a book. For now, the way contributions to my art adventure goes will continue much the same with a charge per piece art, unless my pace really picks up in which case I may look to moving it to monthly subscriptions to be fair to my patrons, so as not to be charging every other week. 😉 For more on how Patreon works, check out my original How to Grow Your Dragon post in which I talk about it, or explore the Patreon FAQs. I shall be looking to update the text of my Patreon page in the next few weeks, after which all completed art postings shall be charged unless stated otherwise, but there will be plenty of free work in progress sketches and updates for patrons to enjoy. 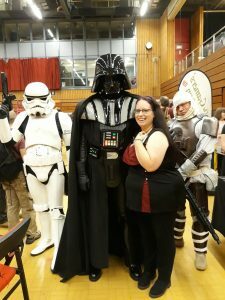 I have been attending OddConUK now for five years now ever since I first went with my husband, one of the organisers, with our newborn baby. Still a lovely, friendly convention at which I trade and get to play some games, I wanted to do something special to mark the tenth year in my own way. I had been helping redesign the website, but my health and my husband’s workload both conspired to prevent us from getting things done in time; however, I still had the odd bit of art I felt I didn’t want to miss out on using for the 10th year! 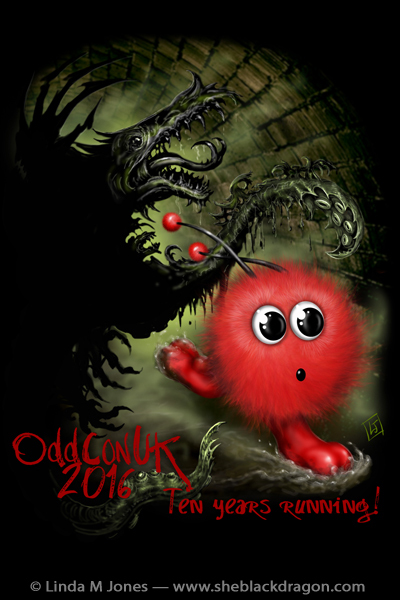 Most evenings, these days, leave me a little worse off with my health, but on one of the rare evenings in which I was feeling particularly energised, I put together this picture for t-shirts for the organisers to wear of a shoggoth chasing the convention mascot, Oddball, through a tunnel. We had long talked about doing a cake. There had been one done back before I started going, but it was simply of Oddball. I felt that we needed to up the ante a little for the tenth year celebration. I decided to have a stab at making it myself. 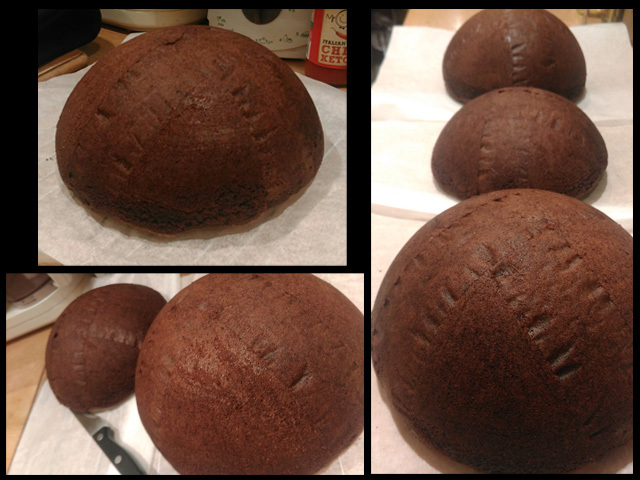 In total, the cake involved enough cake mix to make five whole cakes! Into a hollow within the centre of the sphere cake, an entire packet of Lindor milk chocolate balls was thrown and smothered with gooey chocolate cake filling. 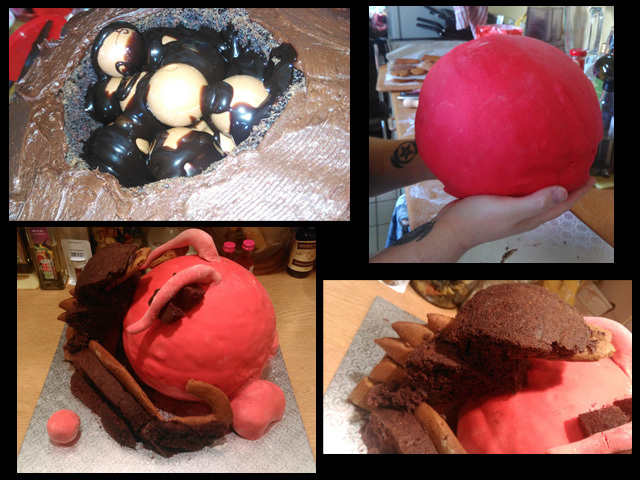 There was a lot of icing and red vegetarian food colouring involved with converting the sphere into the perfect body for Oddball. 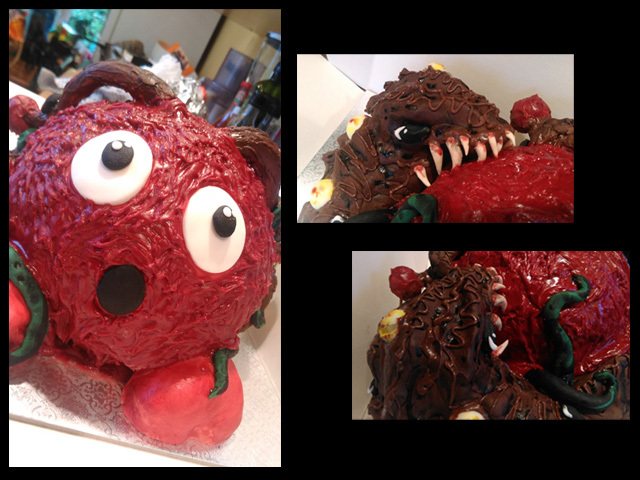 Set in place, I began the process of building the shoggoth having captured the poor mascot! 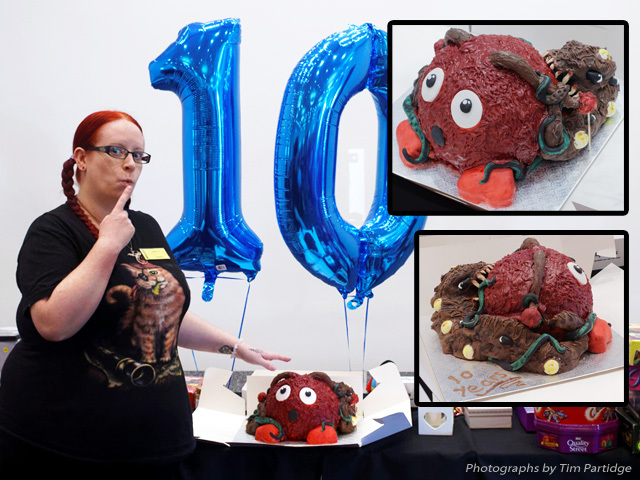 Four cakes went into the making of the sphere and a fifth was used to break and sculpt the body of the shoggoth on a skeleton of gingerbread. Unfortunately, the icing tool I had ordered to quickly do his fur didn’t arrive in time and I had to improvise techniques to create the fuzz look I wanted. In addition to several packets of variously coloured icings, half a packet of Lindor white chocolate balls went into making tasteful pustules adorning the beastie! 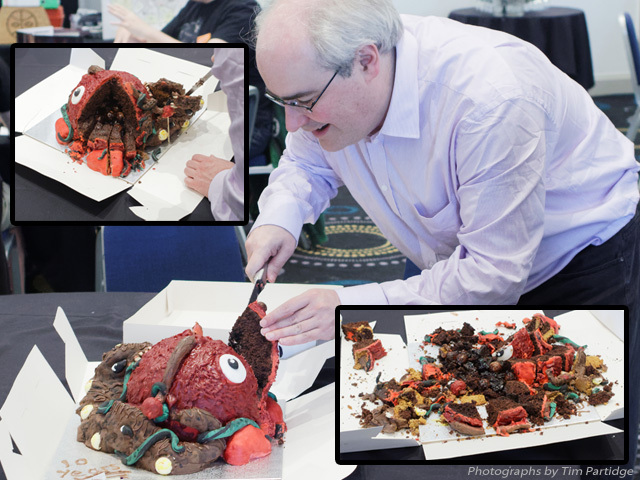 The cake was heavy, so in addition to the main raffle at the convention a separate, earlier draw exclusively for the cake was made to allow the winner, if they so desired, to share the cake with the convention. This is precisely what happened and the cake, indeed, fed all of the delegates in attendance. 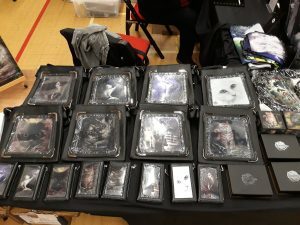 Last Saturday, I was at Dragondaze in Newport again with my trade stand. 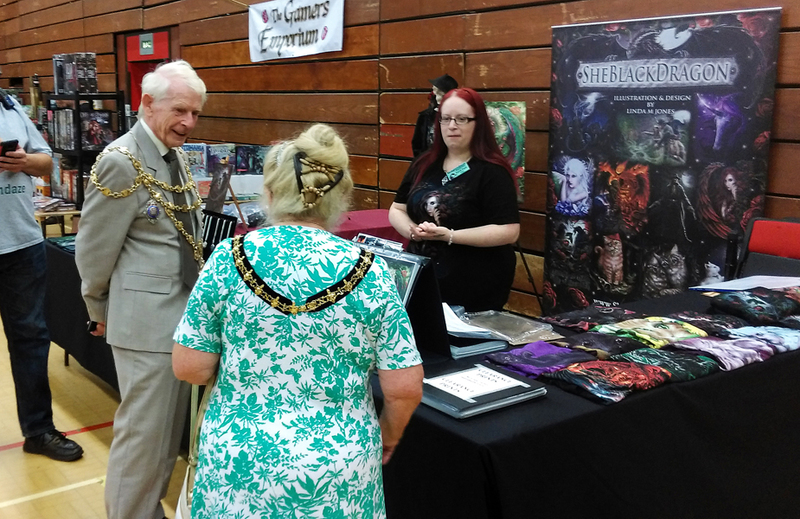 As ever, it was a fun experience and good supporting a local convention. I even had the mayor and his wife come along to have a chat. 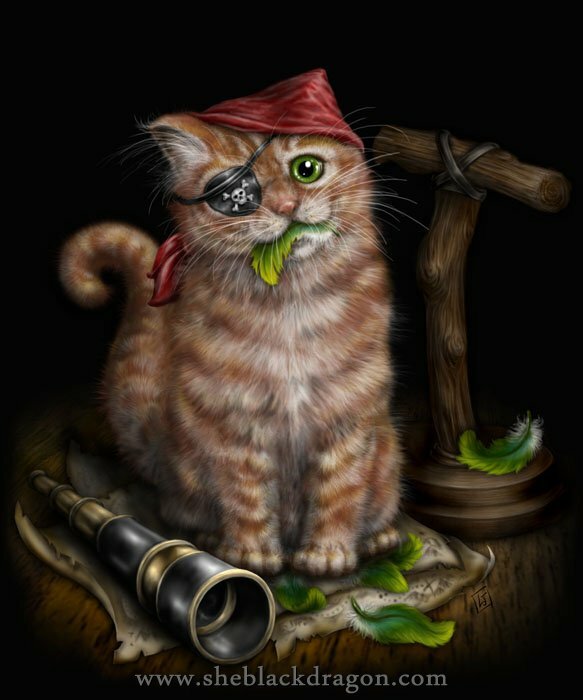 Amongst some of the colourful characters about the place, was a particular someone who kept trying to steal my treasure! 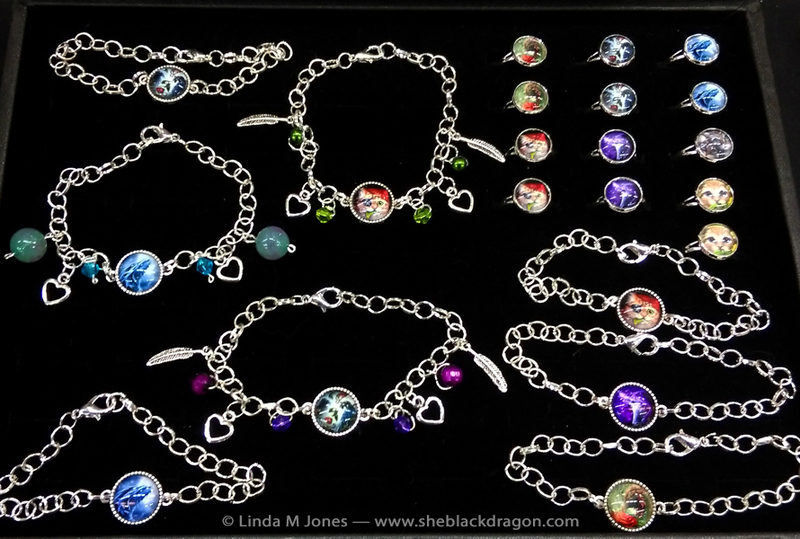 Speaking of treasure, this year I took the time to experiment with some of my own crafts and took to making some of my own jewellery to sell. This was my first attempt making jewellery and they were well received, and I busied myself during the day making more behind the stand. The attendance was a bit lower than last year due to unforeseen events, such as train closures, but I certainly hope it continues next year! 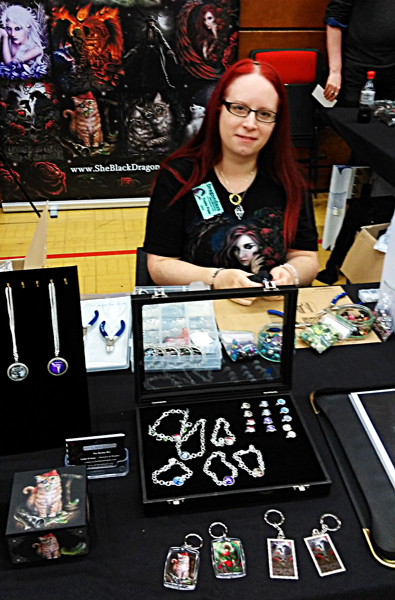 The lovely dragon lady donning her newly purchased Rose Dragon pendant. 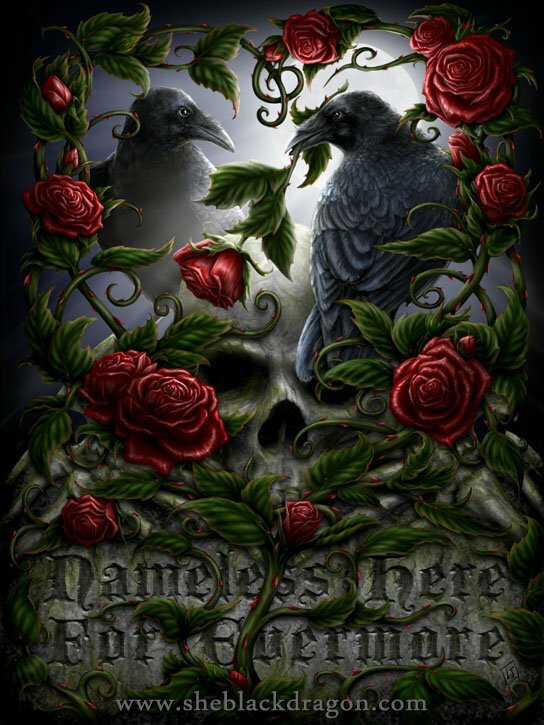 While I still have many designs licensed for t-shirts, not all of my designs have been taken up at once. 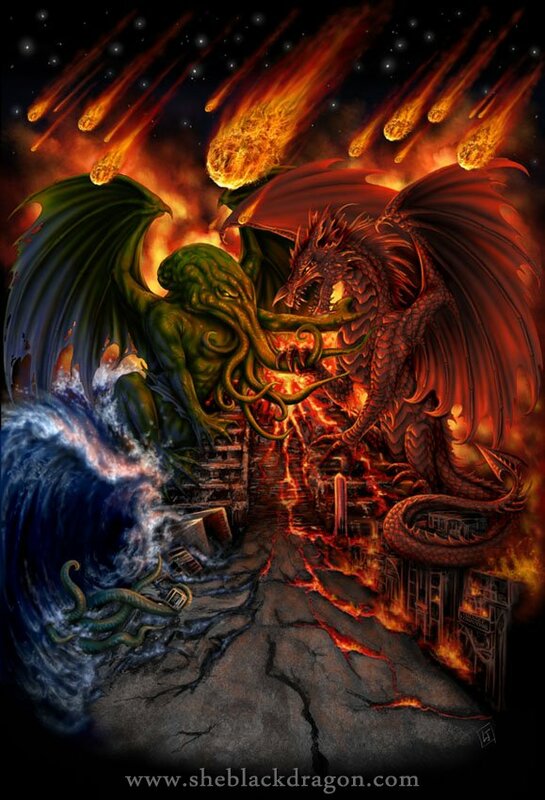 So, in an effort to make more of my designs available and since there have been lots of demand for certain designs on t-shirts, I’ve looked into providing them myself direct to fans of my art and available for me to sell at conventions. I’ve looked at a number of options, including the time-limited campaign model that seems very popular on social media at the moment. 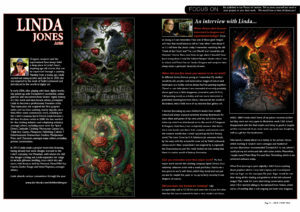 The main problem was that what I really wanted to do was simply make my designs available to the people who wanted it. I found one that I hope will work nicely and better yet they have a very ethical model, with the t-shirts made from organic cotton from ethically accredited wind-powered factories with full traceability. UK-based Teemill have limits on how many products I can list currently, so I may have to swap them out from time-to-time until that limit changes. 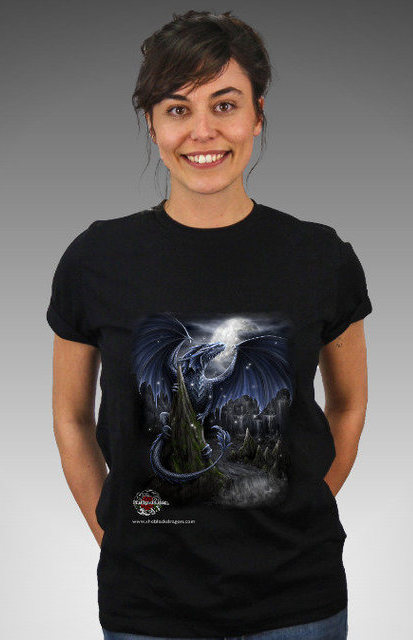 Most of all, I’m very excited to finally get my Blue Moon Dragon onto a t-shirt. This one, particularly, has been much requested and it’s now available in a number of styles, including unisex, women’s fitted, youth, hoodies, and more. 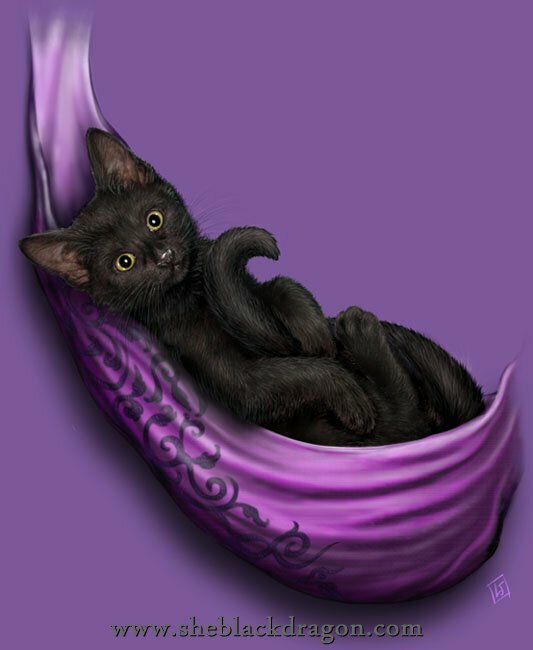 Also available are Daemon in Rosa and Pirate Kitten. Meanwhile, prints of any picture on my site are still available, simply contact me directly for a quote. You can also follow them on Facebook, Twitter and Instagram. 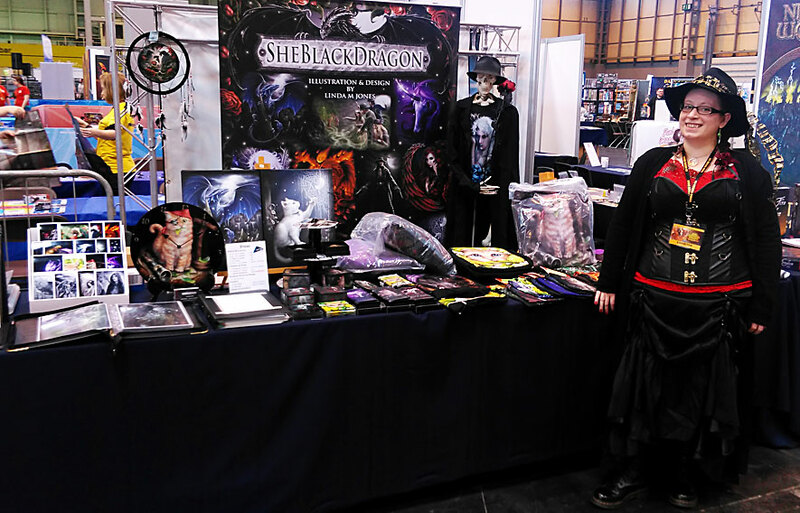 When I first went to UK Games Expo in Birmingham back in 2014, the attendance was a huge nearly 6,000 people. This year, apparently larger than Origins in the US, the attendance was more than double at 12,500 people! 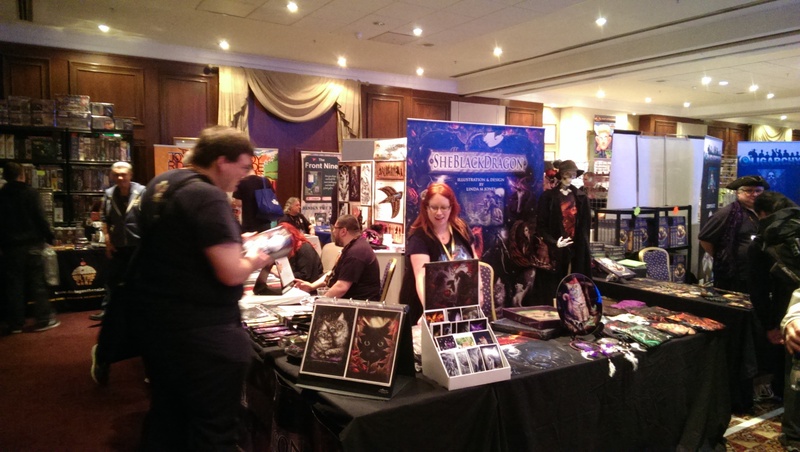 This year was the first year the trade hall, amongst several other aspects of UKGE, moved into the NEC 1 with roleplaying at the Hilton Metropole, where formally the entire convention was located. 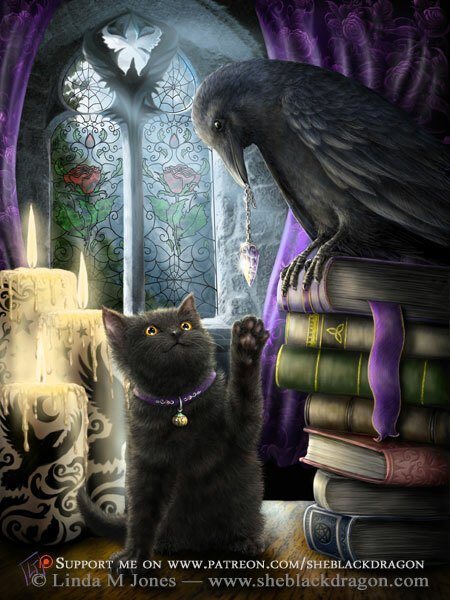 In addition to trading, I was once again a guest artist and I again provided art for the treasure hunt, took part in a seminar and co-ran a workshop. This was the second workshop co-run with Gillian Pearce in which we looked at how to handle a very open-style art brief for a monster design. We had a lovely range of people, young and old, varying from students, hobbyists, people wanting to get into the industry and even the odd person already in the industry just wanting to get a few tips. 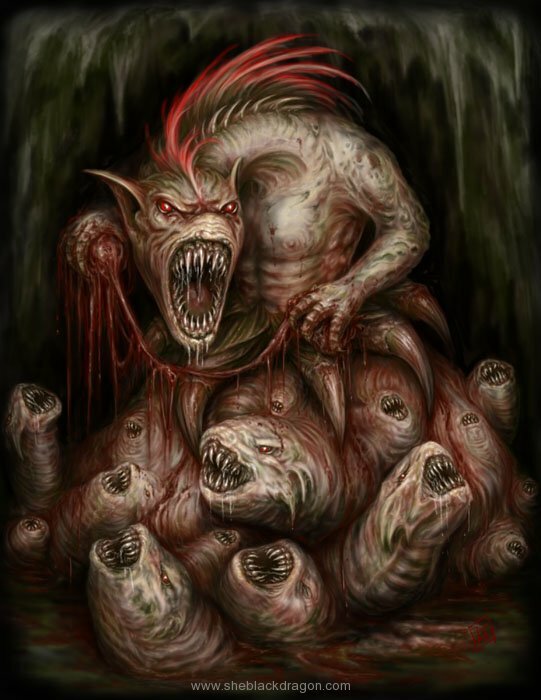 The group was given a brief for designing a monster, purposely kept very open for interpretation, allowing each person to use this to focus on an aspect of art they want to practise or get advice about. Gill put together a wonderful booklet, which included my original brief for all who attended, and I also brought along a few interesting props, including skulls, horns, pine cones, feathers, etc. It looked like I’d brought the cultist’s table to the workshop! Overall, I think everyone had lots of fun and they all left with a monster or two, and it was fantastic to see everyone’s own interpretations of the brief. I felt privileged to be in a panel of six artists, including myself and Ralph Horsely, Gillian Pearce, Andree Schneider, Vicki Dalton and James Hayball. We all came from varying styles and companies with whom we’ve worked, so we could really present lots of perspectives on the subject. 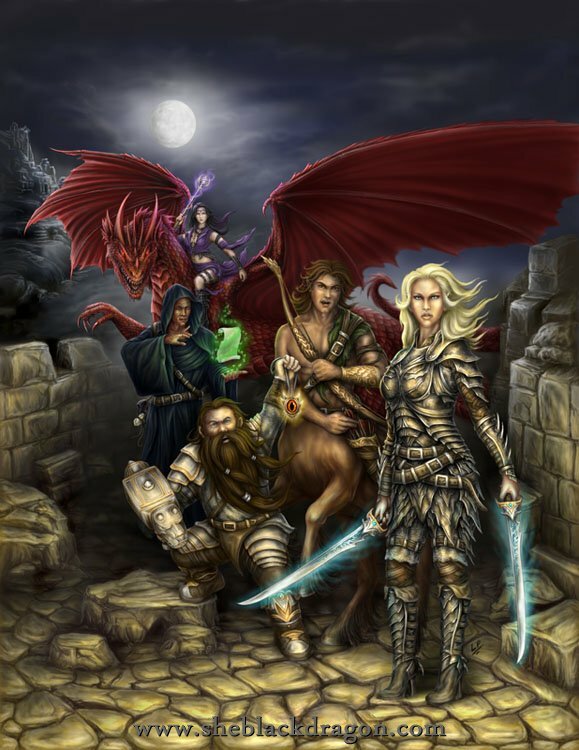 This year the seminar focused on how art can enrich the world of gaming, complimenting the words in the case of RPGs and express tone in other games. 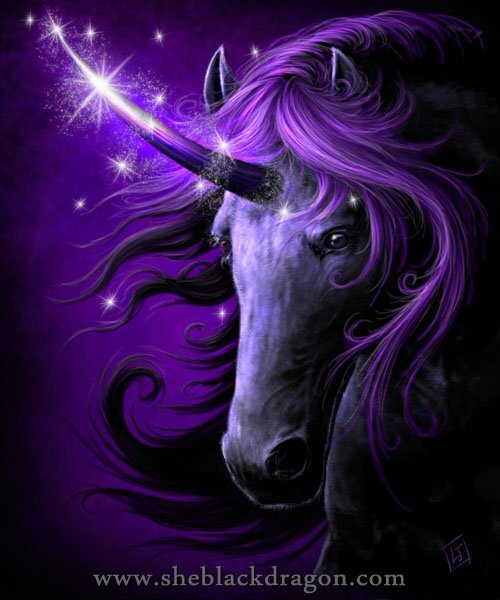 We also discussed how art can really define the diversity of popularly recurring subjects, such as orcs and airships, such that you can easily tell to which product that interpretation belongs. Coming from a cartography perspective, Gill covered the importance of maps as a visual aid for both running and playing the games. 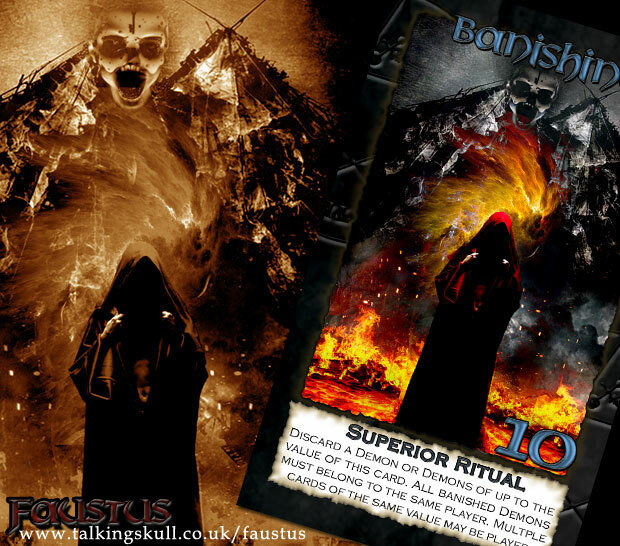 I felt the seminar went really well, and there was some nice recognition from attendees of my pieces for Call of Cthulhu 7th Edition (finally released this year, and one of which was used on the programme cover of my first year as a guest). 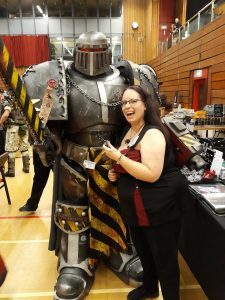 It’s always fun attending UKGE and the organisers did a really good job considering the massive change this year and increase in attendance. 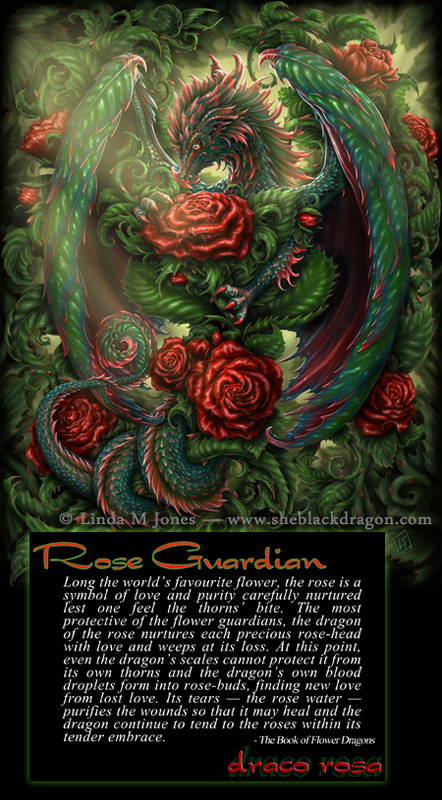 It was wonderful hearing the response on my latest dragon art, Rose Guardian, and hearing thoughts about my Patreon project. One of the fans of my dragon art, a lovely lady who also backed me on Patreon, was getting the artists to do interpretations of her dragon persona, for which she even had her own design brief. This was really fun to join in with and to see how different everyone’s dragons styles looked, though I had to make sure to add in her favourite flower. 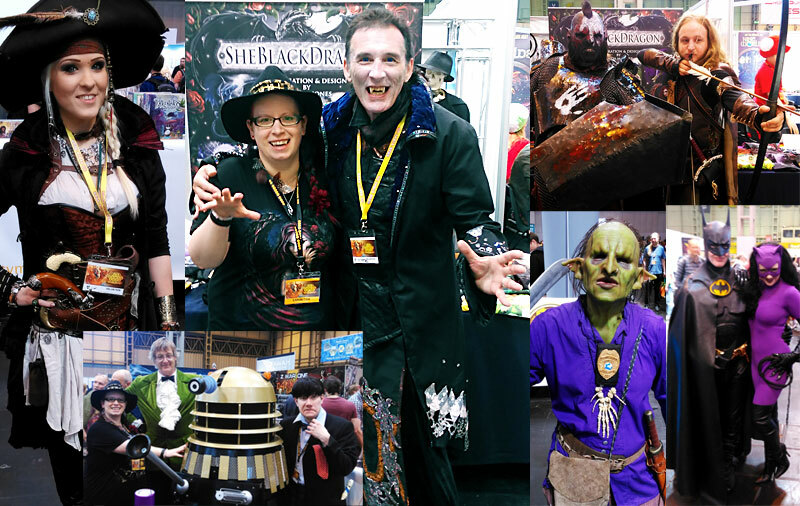 There was also some wonderful cosplay characters, of which I only managed to nab a few photos, but there were so many great costumes. A particular favourite of mine was, because I’m also a fan of vampires, was the gentleman who dressed as Victor from Underworld. As always at conventions, it was fantastic getting to see faces old and new and this year a wonderful surprise running into Nick Angell. Back before I got into freelance, me and Nick used to work together in the Woolworths cafe and it was Nick who directed me to DeviantArt, from which I started posting up my first pieces of work online and getting in touch with other artists and, well, the rest is history. Nick, meanwhile, went off to do comics, but was there with his first card game, Sandwich Masters, released through Big Punch Studios. Which looks awesome and hilarious, and all the more amusing as I remember us making unusual sandwiches in that cafe! All in all, it was an awesome time and thanks to the organisers for having me as a guest again and I hope to attend again next year. I’ll be blunt, last year was not kind to me. 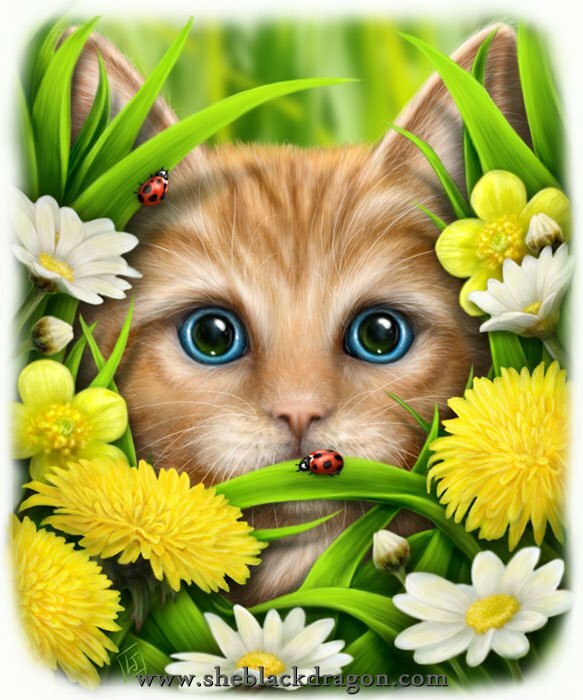 Just at the start of an exciting move into licensing, and companies enthusiastic about my art, many exciting projects both for licensing and commission, I was floored with a mysterious health issue, still seeking a diagnosis, that seriously debilitated my ability to work. While it continues to have an impact on my life and my ability to work to the same level that I had before all this began, I’m not letting it get the better of me. I embark upon a new approach to my art this month with the launch of my Patreon page – but more on that later. Firstly, let me talk a little about the art. I’ve not finalised names yet, but I’m quite excited about this project. I wanted to get back to my roots. Since I don’t know how much worse my health might get and how much it may further impact my work, I wanted to focus my attention on projects that I’m passionate about. 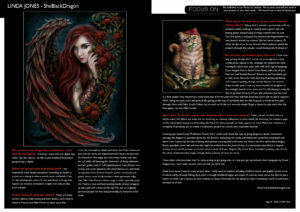 I love painting dragons, as my moniker might suggest, so I wanted to take a fresh look on them. 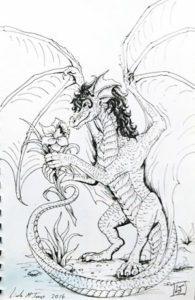 Growing up, I loved Cicely M. Barker’s Flower Fairy books and I loved the idea of giving dragons a similar treatment. 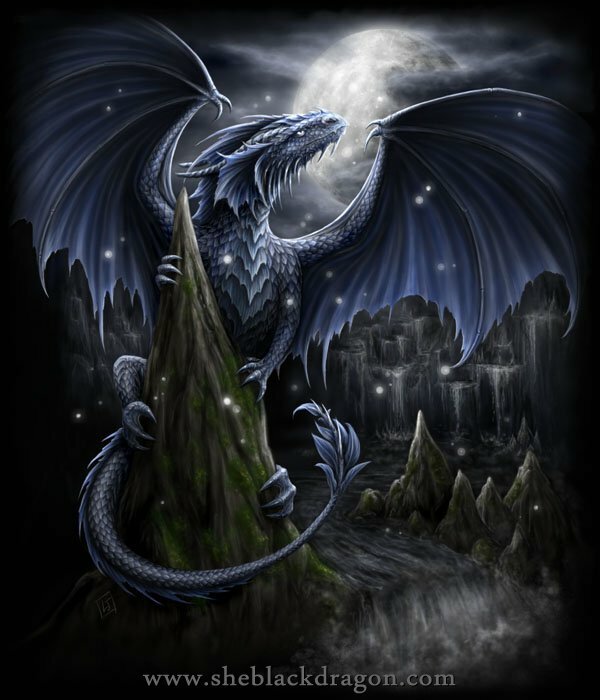 I envision the dragons as guardian spirits for the flowers, embodying the myths and folkloristic symbolism associated with them. I struck upon the idea of doing a collection of paintings to explore this. 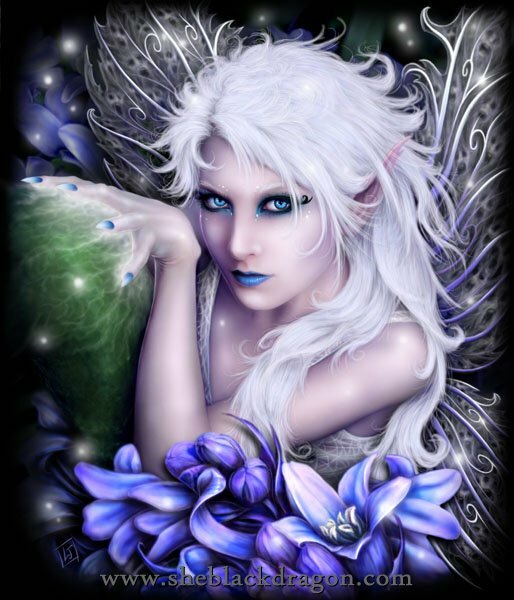 I love fantasy worlds and was inspired by the idea of having each picture accompanied with some text from a world in which these dragon flower guardians were real and how this might be written from the point of view of a passionate naturalist of a magical version of our world. Perhaps as extracts from a book of flower dragons. 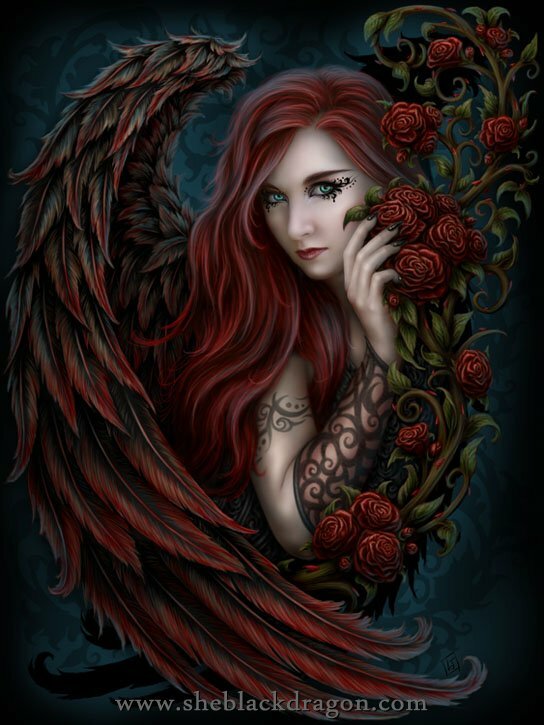 My first painting, Rose Guardian, is an important one to me as it marks the beginning of my journey and a return to some of my favourite art. 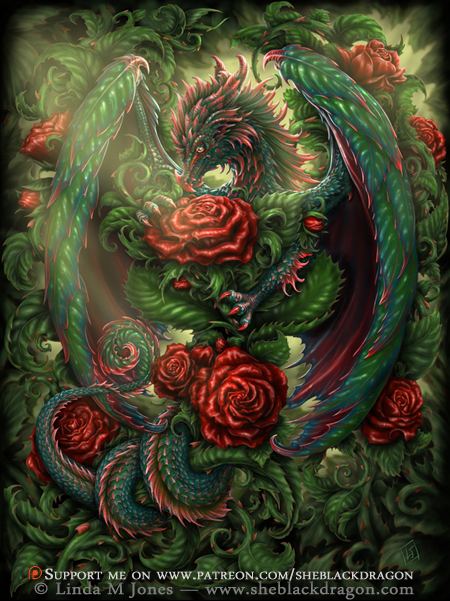 I love painting dragons and I love painting roses, so it was the logical beginning to my collection. This should give you an idea of the quality and direction of this new collection. 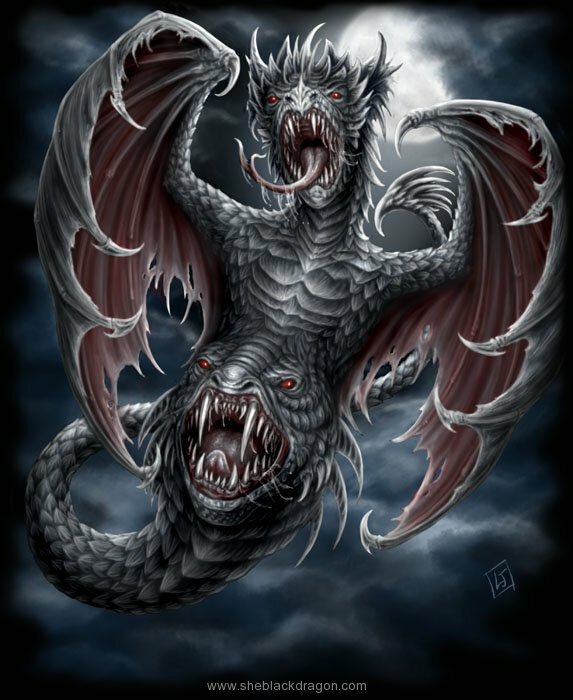 Of course, each dragon will retain its own flavour and draw from the symbolism connected to their flower. I’ll be showing more about this design, including sketches and some of the process leading towards its completion as well as previews of future designs, on my patrons-only feed on Patreon. 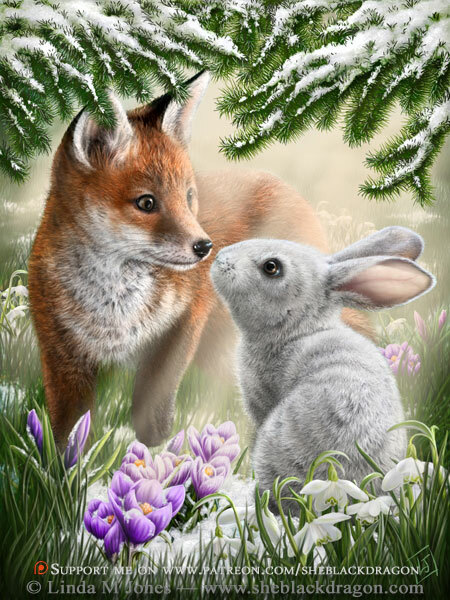 I’m not just painting this collection for love alone, but to make available for licensing, but I’m aware that not all the companies I license with may be able to take the whole collection or be in a position to take them on right away. 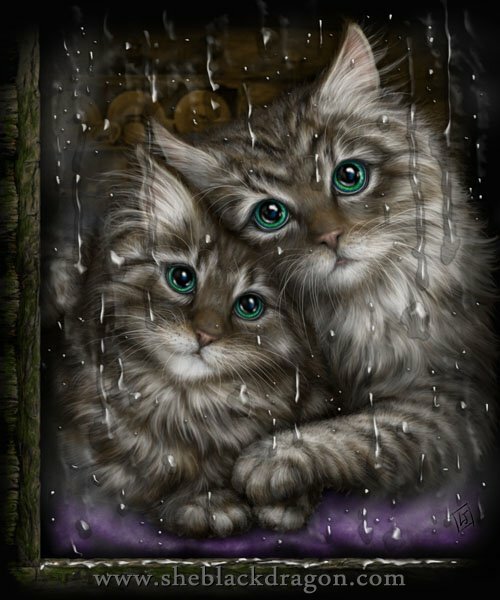 However, I don’t want this to stop me creating the paintings, but of course this alone isn’t necessarily going to sustain me and my family. Patreon is a fantastic take on crowd-funding and patronage. Artists and creatives can use it as a platform to gain funding (whether monthly or per creation) to keep doing what they love doing. If you’re in doubt as to whether you can afford it, you can support for as little as $1. That’s nothing, really. Since I have opted for “per creation” it means I only collect funding once per design as opposed to every month regardless. Here’s a breakdown of how effective Patreon can be. Currently, I have over 11,800 people following my Facebook page. Without spending any money to promote posts and depending on how many shares a post gets, I can reach between 1,500 – 11,000 people. If only 500 out of the 11k+ people who like my Facebook page pledged $1, that would mean I get paid $500 each time I create a design, which I’m aiming for about once (and no more than twice) a month barring health or life commitments delaying me. For just $1, you get notifications of my public posts and can follow my progress. If half of those 500 upgraded to $3 per creation, I would get $1,000 per creation, and each person supporting me for $3 would get access to my patron-only posts, which include sneak previews of future work, insights into the design process, and maybe even some short tutorials. If half of those 250 $3 patrons upgraded to $5, my patrons would support me with $1,250 per design and those 125 $5 patrons would also get digital wallpapers of the final design and 10% discounted prints. If only 60 people from those 125 patrons upgrade to $10, each design would be worth $1,550. Those $10 patrons would get the same as the $5 patrons but with 20% discounted prints instead. If half of those $10 patrons upgraded to $25, each design would be worth $2,000 and those 30 patrons supporting me for $25 would get prints at half price. The $50 and $120 tiers are limited, so if the maximum 8 patrons upgraded from $25 to $50, they would also get an original hand-drawn mini dragon-head sketch and each design would be worth $2,200. And finally, if two of the remaining $25 patrons upgraded to $120, they would also get a canvas print and make each design worth $2,390! In that final calculation, 490 of 500 patrons are paying no more than a pizza, of which over 350 are only buying the equivalent of a cup of coffee or two. At $50, I’ll add extra content into my patrons-only posts to include sketches, previews of detailed work and more insight into the design process. At $100, I’ll send out postcard prints with a flower dragon & the text on the other side of the design to everyone who supports me at $10 or more. It’s been quite a while over the course of most of a year, firstly due to the birth of my second daughter and a few complications surrounding that. Then there was the general trying to catch up with work and then moving house at the start of the year, which was sadly also the start of a long ordeal of still ongoing personal health issues. This year has felt like something of an epic battle juggling deadlines and dealing with everything the universe is throwing at me. So a big apology up front to anyone who I’ve not messaged back over the months of chaos. 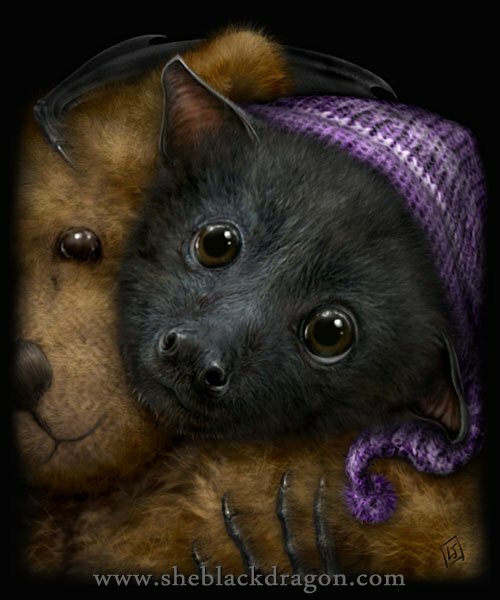 It may take me some time, but I’ll try to get back to as many as I can, though please be patient as my health issues are still ongoing. Meanwhile, my Facebook page reached over ten thousand Likes without me noticing; quite the milestone and I’m just so grateful to each and every one of you for continuing to Like and share my art and page. 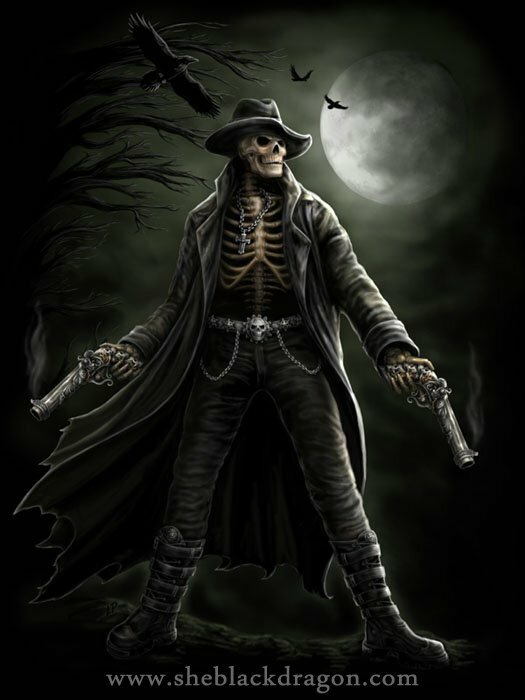 I promise I’ll be getting more art posted soon, as and when I can. 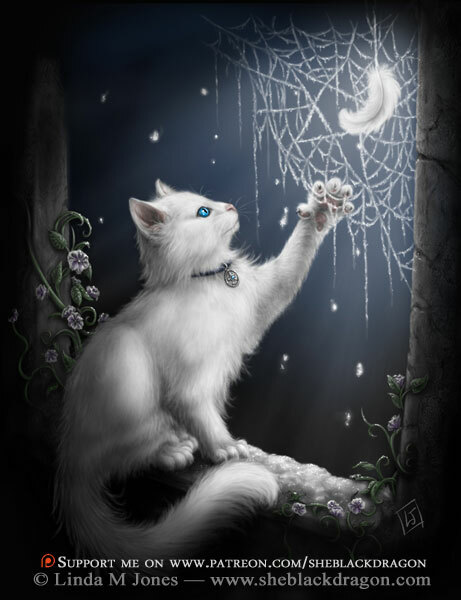 I’d like to take this opportunity to make a special thanks to a page that has continually shared my work, even in my absence: while there were a lot of pages sharing my art, Ghost’s Wolves & Dragons, Fairies, Witches & Wizards and a little fantasy page really shared so much continually, even digging out some of my really old stuff I’ve not even put on this website. Go follow the link and check out the page, there’s a lot of other fantastic work showcased there. 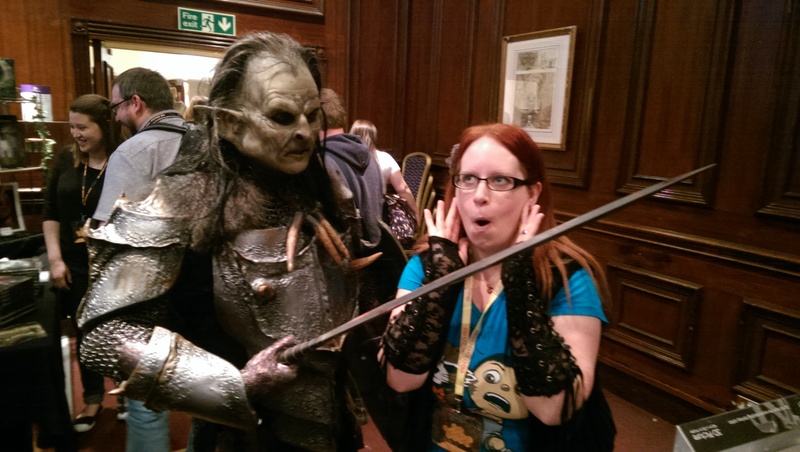 On the convention front, I did UK Games Expo again this year and it was really, really busy and really good. 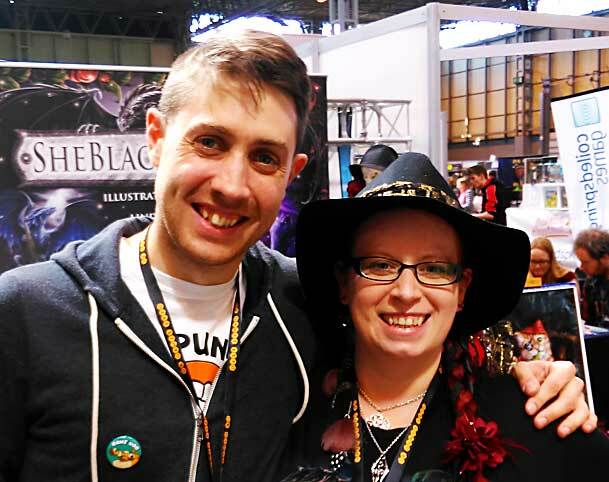 While this kind of deserves a post on its own, worth mentioning here is that I co-ran my first workshop with Gillian Pearce of Hellion’s Art, which was really fun.